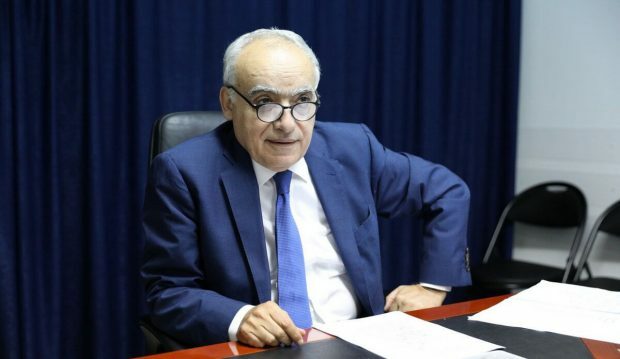 UN envoy Ghassan Salame said Tuesday the National Conference in Ghadames will be delayed given the current war in Tripoli. “The decision to hold the National Conference had been made on the basis that the situation had matured, and that the necessary conditions had been met to enable an effective solution to the crisis in Libya through a political settlement, the establishment of a national charter and commitments that could be given to place the country on the path of recovery, towards peace, restoration of unity and sovereignty and a decent life for the Libyan people.” Salame said in a statement. This is what we had come to believe in recent weeks, after a year and a half of extensive consultations with constituencies and groups across Libya. We have noted the willingness of most actors to concede parochial interests and push for a political solution, around practical options to be discussed by participants based on the principles, demands and red lines clearly articulated to us by the Libyan people. “We started to invite attendees to the Libyan National Conference, not to create a new structure from amongst a certain political elite, nor to “share any cake”, but to discuss options and ensure that the Conference’s outcomes are acceptable to all Libyans and true to what has been discussed during the Libyan consultative process.” He remarked. “The serious developments on the ground must be treated with the responsibility and time they require. We must not waste the historic opportunity of the conference or the opportunity to move away from the past during which the Libyans have experienced tragedies and witnessed a deterioration of living conditions, depletion of their resources and exhaustion of their patience. Nevertheless, being cautious and careful in no way means that we will deviate, even in the slightest, from our long-expressed commitment to the tens of thousands who engaged in our national conference consultations, to do our utmost to achieve the earliest possible unification of political and economic institutions, to ensure the establishment of a sovereign, united civil and democratic state that respects the rights of all citizens, delivers justice to all of its regions and social groups and ensures a peaceful transition of power where only the ballot box is the adjudicator.” The statement explained. “I therefore reiterate that I am more determined than ever to hold the National Conference at the earliest possible opportunity, as we cannot allow the historic opportunity it presents to be lost. We also cannot ask Libyans to attend a Conference to the backdrop of artillery shelling and air raids as we must ensure that all of those who expressed willingness to respond to this historic and national event from all over the country are able to attend and are able to voice their opinions freely.” Salame remarked. He said he will work, to the fullest possible extent, to enable the Libyan National Conference to take place as soon as possible, once the conditions to enable it to be held are re-established. “I will work day and night to put an end to the current military escalation, ensure that reason and national interest once again supersede force and mend the external differences to enable the resolution of the crisis in Libya.” He added.